I had the honor Saturday of attending a special Master Mason degree. What made it a little extra special was that the new Master Mason, Brother Mark Gordon, is in the Navy. All brethren in attendance who were servicemen were encouraged to wear their uniforms. At the conclusion of the lectures, the presiding WM - my friend and brother Harley Caldwell - sat the new Master Mason next to him in the East for the closing. I strongly feel this is a wonderful thing to do, and is the final touch that denotes the specialness of the event for the newest Master Mason. In keeping with that notion, it was a tiny thing, but PGM Richard Elman closed in ample form, and at the conclusion, he had Brother Mark ascend the steps to the East to whack the closing gavel. The grin on Mark's face said it all. What was especially outstanding about the degree was that almost every participant was under the age of 25. They were excited, they were enthusiastic, and they left a lasting impression on the new MM. Brother Joe Angli wrote a very special optional military charge that he presented to Mark at the end of the degree. It was moving and dignified and did a masterful job uniting the conduct of a Mason with the duties of a soldier. airman or sailor. I'd like to post it here. "My brother, you stand before your peers clothed in the badge of a Mason. Thrice have you been obligated, divested, reinvested, and instructed on the customs, traditions, and lessons of our great fraternity. While this course of instruction and its steadfast application to your life would be enough to distinguish you from the rest of the community. Simply recognizing you as a Master Mason on this occasion would be incomplete because, while you wear the white apron, you also bear a uniform of the great United States of America. As you have been instructed, the internal and not the external qualifications of man are what Freemasonry regards. The honors upon your breast, the shine of your shoes, and the appearance of your uniform, though worthy of respect, are of little consideration to our Craft. Your mind, conscience, and heart rendered you worthy and well qualified, ensured you were duly and truly prepared, and fortified your recommendation. Your work amongst the craft has and, I am certain, will remain honorable. It is at this critical juncture in your Masonic journey, when you spend your first few moments standing erect as a Master Mason, that I admonish you to reflect on your chosen profession and its relationship to our Order. Liberty, equality, and fraternity are the principles upon which our Republic is founded. Our founding fathers took these lessons from our ancient brethren and gave them life in the Declaration of Independence and our Constitution. As you bind your life to the ideals contained in these documents as well as to the fraternity you see that, in both cases, there is only one course of moral instruction that prevails. There is only one doctrine that, with the aid of the Great Architect of the Universe, guarantees that the people of this country are able to stand fast as a free and independent nation. Yet as similar as these stations may seem – the one fraternal, the other professional – there is a very important difference. Just as there has been a need for defenders of faith, so there is a need for those who will defend our ideals and carry them to the far corners of the Earth. It is necessary for someone to sacrifice his life so that others might live free, to carry the scepter of light to those in darkness, and to proudly and defiantly say “I am an American and Freemason” to all those who would deny the universality of our ideas. You have chosen to carry this mantle through your generation. I bid you carry it high as you would your most prized possession. Honor it as your most solemn engagement. Treat it tenderly as you would a young woman so that when the sun sets on your life she may look on your earthly remains with respect. That she may feel the experience of your presence, and gaze daringly into the future as the sun rises yet again on another generation of men bound as brothers – loyal to the flag. The lodge that this degree was performed at is on the outskirts of a large college town in Indiana. Literally tens of thousands of students pass within blocks of this lodge every day and never give it a second glance. These young men, many of whom are members of other lodges, are taking on the project of raising the awareness of Freemasonry among college students, and I am confident that they are on the verge of very great thibgs. The older men at this lodge are grateful and open to changes that will keep their lodge open and bring the message of Masonry to a new generation. Masonic Darwinism is at work across the land, and lodges like these will grow and prosper. I am truly excited to see it happen right in front of my eyes. I had a great day in lodge on Saturday. Do we say that often enough? I had a great day in lodge on Saturday. My mother lodge, Broad Ripple #643 made the long, arduous pilgrimage to the river town of Madison, Indiana, the birthplace of Indiana's Grand Lodge. Many young Freemasons in Indiana are unaware of the Masonic treasure hiding in an unremarkable brick building on a quiet street in Madison, Indiana. It is a place every Indiana Mason should visit, and even better, the perfect setting for a new candidate's initiation into the Craft. Our candidate was a fine young man, but the day was made especially poignant by his father presiding over the degree, while his father-in-law looked on. And even though the truly horrid weather raged on outside, it was a great day in lodge. Since our last trip down, a local lodge in the area has donated furniture, rods, etc, which makes it a little less of an expedition than it used to be. We no longer have to bring so much stuff with us to perform the degree. Madison is a terrific place to explore. Maybe you saw the eponymous movie last year about the annual boat race on the Ohio that takes place annually. Its physical setting couldn't be more beautiful. Homesteaders began populating the area in the early 1800s. In about 1810, settlers purchased 65 acres of land from the Indiana Territorial government for about $2.50 per acre and christened the town "Madison" after the reigning President of the United States. Indiana became a state in 1816, and Ohio and Kentucky lodges banded together quickly to form a new Grand Lodge of Indiana. The Grand Lodge of Free and Accepted Masons of Indiana, was organized in what we today call Schofield House on January 13, 1818. Built in 1816 in the federal style, this is believed to be the first two-story tavern house in Madison. The five lodges chartered at this first meeting were Vincennes #1, Madison #2, Charlestown #3, Lawrenceburg #4 and Corydon #5. Alexander Buckner, of Charlestown Lodge was the elected the first Grand Master. The large lodge room on the second floor was originally for overnight traveling guests. They were served their meals in the kitchen on the first floor, and the room directly below the lodge room was a tavern from which the brethren could order their wine, whisky and ale. The corner room was a general store, where, among other important items, their treasured cigars were available. In 1972 the Ancient Accepted Scottish Rite in the Valley of Indianapolis purchased the property from the heirs of Mrs. Charlotte Schofield for eventual presentation to the Freemasons of Indiana. 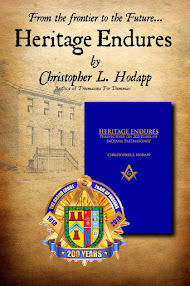 It was turned over to the Masonic Heritage Foundation, and extensive restorations were made. The building was opened to the public as a Masonic museum on April 19, 1975. The upstairs is suitable for conferring degrees on candidates, but most would agree that the Entered Apprentice degree is the simplest to perform in the small room. It does not lend itself well to the MM degree, as there is limited floor-space and limited areas for seating. Be aware that the stairs leading up to the lodge room are steep and most certainly NOT handicapped accessible. In 2005, the Schofield House is open from April 5th until October 31st; Monday, Thursday, Friday and Saturday from 10:00AM until 4:30PM, and on Sundays from 1:00PM until 4:30PM. It is also open November 1st through April 4th by appointment. Nestled on the Ohio River, beautiful and historic Madison, Indiana is a terrific place to spend the day or a whole weekend, and the area is dotted with wonderful Bed & Breakfast establishments. Your ladies will not be bored while you are engaged in Masonic activities. There are also a number of nearby restaurants and taverns for your post-degree celebration, including the nearby Historic Broadway Hotel and Tavern, which dates from 1834 and is the oldest continuously operated hotel and tavern in Indiana. Which is still cigar friendly, by the way. And the perfect place to end a great day in lodge. For tour information about Schofield House, or to schedule the restored lodge room for a degree, contact Curator Melvin Vonderheide at 812-265-4759. Wow, did I stumble into an incredible library cataloguing service. 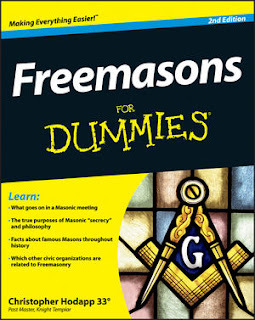 It's called LibraryThing - have a look at my Masonic and related library. I've added a sidebar to the FMFD website , mostly because the nice Dummies folks wouldn't allow me to add footnotes or a bibliography to the book, nor would they let me publish a list of recommended books for further study. Fair enough, they are not in the business of selling other people's books. So, if you want to know where I got my research from, have a look at my library list.